Michele my Meyer lemon has been babied, coddled, watered religiously, fertilized and talked to since November. This is her second fruiting for me. 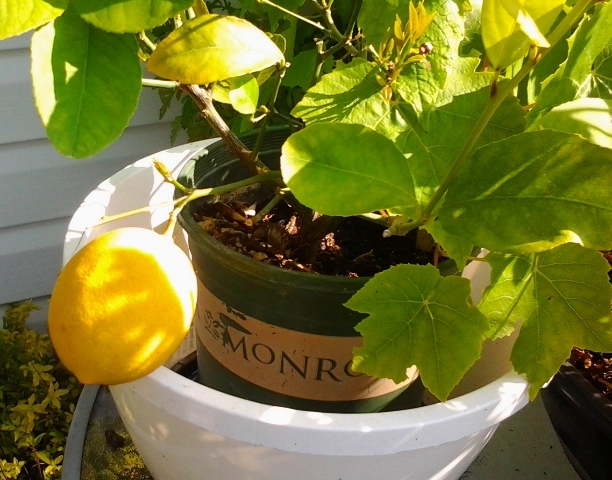 Once her lemon is truly ripe to pick, then I will transplant her to a bigger pot for the winter. The scarlet runner beans and the willow have become great buddies much to my delight. Two years ago, this willow 'tree' was actually a willow 'stake' that I put in the pot originally for the scarlet runners to climb, and it sorta like topsy, grew. I wasn't sure if there was enough room in the pot for the beans to put down their roots but the willow accommodated them. I love how the bright orangey red of the scarlet runner is such a surprise among the willow's green branches. The beans are twining nicely and I have begun to train to them to bend the willow branches down. Stay tuned, I let you know what kind of Fall harvest I shall have. Blessings of a sunny Sunday to all who read this.